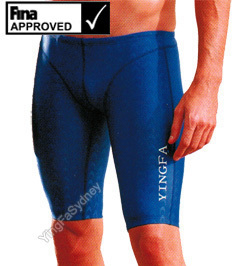 The Yingfa swimwears listed below have all been approved by FINA. Those that also have the FINA Barcode and Approval number printed on the fabric are shown below with an image of the barcode. Yingfa 9205 "shark skin" Jammers. The "sharkskin" material cuts through the water improving your glide due to the teflon coated fibres used in the fabric. The fabric compresses the body to stop skin vibration and muscle oscillation to save energy and reduce drag. They are chlorine resisting so that they can even be used as trainers. It is light in water and quick drying. FINA approved. Yingfa 9205 "shark skin" Jammers. The "sharkskin" material cuts through the water improving your glide due to the teflon coated thread used in the fabric. The fabric compresses the body to stop skin vibration and muscle oscillation to save energy and reduce drag. Competitive swimsuit, high in performance that maximize speed in the water by reducing drag and increasing water flow. 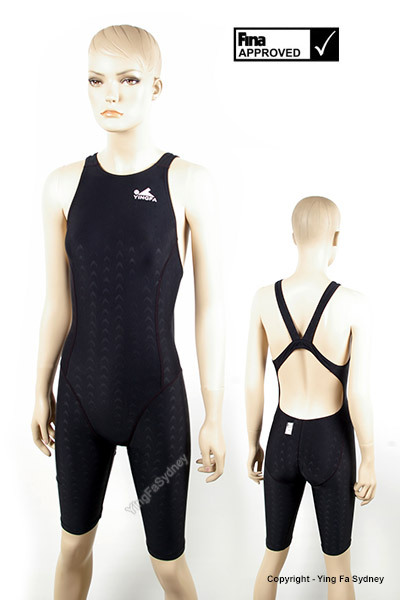 The mesh seam at the rear is to aid swimming performance by reducing drag. The textile fabric in the suit is water resistant. The fabric when knitted or woven tight provides a limited barrier between the body and the water. It allows the swimmer to sit higher in the water and therefore reduce drag and restriction. The suit is black in colour, extending to the knees. FINA approved. The 'Sharkskin' material used in this swimsuit cuts through the water improving your glide due to the teflon coated racing material used. The fabric compresses the body to stop skin vibration and muscle oscillation to save energy and reduce drag. Designed for competition swimming and FINA approved. This suit is all blue in colour and extends to the knee. Advanced technology has been used to develop the "Apollo" waist to knee jammer. Yingfa has found that the fabric "E'Tanche" used in the 9402 Apollo is water resistant. This fabric is breathable while allowing the swimmer to remain drier and therefore maintain a better position in the water.The stitched panel design generally provides a better fit and compression control than seamless alternatives. FINA approved. Black with grey detailing with grey stitching over the seams. FINA approved. Blue with charcoal grey detailing with white stitching over the seams. Advanced technology has been used to develop the "Blue Shark" waist to knee jammer swimsuit. Yingfa has found that the fabric used is water resistant. The fabric is breathable while allowing the swimmer to remain drier and therefore maintain a better position in the water .The material cuts through the water to improve your speed and glide due to the teflon coated racing material used. The material is a plain black. FINA approved. This swimsuit extends to the knee and is black with bright blue stitching along the seams. The new generation lightning "sharkskin" knee skin/suit has further body seams to allow a better fit and to improve muscle control to reduce fatigue. The excellent Yingfa "sharkskin" material lets this suit cut through the water to improve your glide due to the teflon coated fibre racing material used. The mesh seam at the rear is to aid swimming performance by reducing drag.This suit is FINA approved. This suit is black with green stitching along the seams. The suit extends to the knee. The mesh seam at the rear is to aid swimming performance by reducing drag.This suit is FINA approved. This suit is black with white stitching along the seams. The suit extends to the knee. 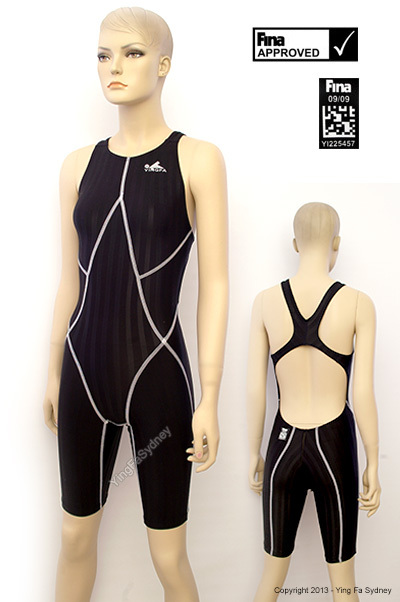 Advanced technology has been used to develop the "Apollo" waist to knee jammer swimsuit. Yingfa has found that the fabric "E'Tanche" used in the 9402 Apollo is waterproof resistant. The pores in the fabric are about 20,000 times smaller than a drop of water, however the pores are actually 700 times bigger than a droplet of water vapour, which means perspiration in the form of water vapour can pass out through the membrane. Therefore the fabric is breathable while allowing the swimmer to remain drier and therefore maintain a better position in the water. FINA approved. Black with blue detailing with blue stitching over the seams. The Teflon coated yarn used in the fabric of this swimsuit improves glide times and chlorine resistance. It is light in water and quick drying. Solid looking rear mesh seam improves water flow and reduces drag. The fabric has a shark tooth pattern in the weave. The Teflon coated yarn used in the fabric of this swimsuit improves glide times and chlorine resistance. It is light in water and quick drying.